"Saint" Martin Luther King, Jr.
"In all the communities which the Lord, your God, is giving you, you shall appoint judges and officials throughout your tribes to administer true justice for the people. You must not distort justice: you shall not show partiality; you shall not take a bribe, for a bribe blinds the eyes even of the wise and twists the words even of the just. Justice, justice alone shall you pursue, so that you may live and possess the land the Lord, your God, is giving you." When I attended graduate seminary, the best theologizing did not occur in the classroom. Rather, they happened on long walks on the vast grounds. It was on one such walk that a confrere named Dave---now a priest in Long Island---asked why the Catholic Church did not canonize Christians of other communities and traditions. Back then, the question seemed silly. Why would the Church declare saints those who did not receive the Word from her pulpits or the Sacrament from her altars? They may have led lives of heroic virtue and Christ-like sanctity, but communion with the Catholic Church is a necessity not an afterthought. Our conversation quickly turned to that great drum major for justice, the Reverend Dr. Martin Luther King, Jr. Why couldn’t he be canonized with great fanfare in St. Peter’s Square? After all Dr. King at great risk, ultimately shedding of his blood, championed for the rights of African Americans and other marginalized peoples. Among the world’s Christians, the invocation and veneration of the saints is a thorny, church dividing issue. Roman Catholics and Orthodox Christians stress that we pay them due honor and respect as by their lives, teaching, and some cases, suffering and death, point us not to themselves, but to Christ the Savior. They are the great cloud of witnesses who surround us night and day. Protestant Christians argue that such piety undermines the role of Christ as the sole mediator between man and God, some going as far as to call it idolatry. Within Anglicanism, the opinion is split. Some side with their Roman brethren others with Geneva. The Reverend Stephen Gerth, rector of St. Mary the Virgin, in New York, made clear the Book of Common Prayer’s position, “[it uses] “saint” in the New Testament manner, to refer to the baptized, and they give the title “Saint” to the holy women, men, angels of the New Testament.”2 Interestingly enough, Martin Luther King, Jr. is commemorated---with prayers and readings--- in the Episcopal Church’s Lesser Feasts and Fasts liturgical supplement. well as the resident alien, the orphan, and the widow among you. "3 They may be free from Pharaoh’s tyranny, but not from the inequality that often plagues human relations. The metaphor of God’s right hand in this text stirs my moral imagination for God’s activity in the world. Let me explain what I mean by moral imagination. Jesus reminds the scribe of Moses’ teaching, the very crux of their faith.5 It is not enough to love God in worship, one must also love Him in other people. Even the scribe, whose aim is to challenge Jesus, confesses that such love is worth more than offerings and sacrifices. At the conclusion of their exchange, Jesus remarks that the scribe is not far from God’s kingdom. Ultimately, right worship and right relationship are linked as one not only informs and enrich each other, but they also speak to the intimate communion God desires with His human creatures. Dave’s question stayed with me for many years after that long walk. Imagine if April 4th on the Roman calendar was the feast of St. Martin Luther King, Jr., preacher and martyr? I am mindful of reality. The unity of Christian believers, like that of the Kingdom is a matter for the Parousia. Yet, there are statues in Dr. King’s memory in churches like Washington’s National Cathedral and London’s Westminster Abbey. It is undeniable that Dr. King’s example has spurred others to champion human rights around the world. While, I hold the veneration of the saints near and dear, I must confess we are sometimes relegate them as distant figures enshrined in marble and stained glass. We do this as if their life stories have no bearing on us. We must never lose sight that their fallen humanity came into contact with the redeemed humanity of Jesus Christ. The saints embody for us, in the here and now, the holiness and justice we are all called to! All holy men and women, saints of God, pray for us! Amen. Father Daniel O. Kingsley, ordained in 2015, is a priest of the Roman Catholic Diocese of Brooklyn. He presently serves as parochial vicar of St. Martin de Porres Parish, Bedford-Stuyvesant. 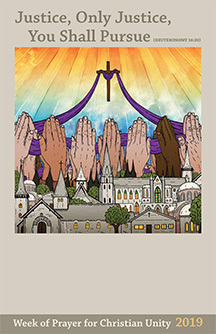 The Angelus, Volume 21, Number 2, https://www.stmvirgin.org/the-angelus-our-newsletter/2018/12/10/volume-21-number-2. Paul’s Letter to American Christians, the text of this sermon can found at Stanford University’s The Martin Luther King, Jr. Research and Education Institute at the following link: https://kinginstitute.stanford.edu/king-papers/publications/knock-midnight-inspiration-great-sermons-reverend-martin-luther-king-jr-1. I’ve Been to the Mountaintop, the text of which can be found at the following link: https://www.americanrhetoric.com/speeches/mlkivebeentothemountaintop.htm.